Packaged FINDINGS: Is Hellmann’s Building on Brand Strength? There are some products that have my undeniable loyalty, carrying on the traditions of my mother, grandmother as well as other family members. One of those products is Hellmann’s mayonnaise. Like most consumers, I have come to know Hellmann’s as much by the color and design of the package as by the product flavor. The bright yellow background of the label and bright blue ribbon supporting the Hellmann’s logo are permanently etched in my brain. Since the original Hellmann’s appeared on shelf there have been a number of changes to the product line that offer lighter or healthier options to consumers. Now, the line has expanded to include organically certified products with flavors like plain, garlic roasted and spicy chipotle. It is great to see this expansion of product varieties, especially organic options, but I do find the package labeling system somewhat puzzling. As we all know, there is a shift going on with consumers and their desire for organic or clean foods. It makes sense that labeling for the Hellmann’s organic products reflect that clean approach to product content. 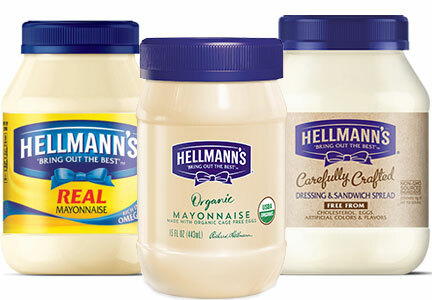 However, when you compare the “real” Hellmann’s label to the newer organic label, the reverse effect is generated – the use of brightly colored graphic elements with the emphasis on real have much greater visual impact than the small, two-color organic set up, making the new package pale and generic by comparison. The result is that the original Hellmann’s package stacks up a huge shelf presence against the competition but also against its “sister” organic products. Hellman’s has also added a product that appears to be a competitor to Miracle Whip, a product that is virtually the same as mayonnaise but with the addition of sugar and reduced oil. I say appears to be, because the label and message hierarchy is also confusing. A single color Hellmann’s logo precedes Carefully Crafted. Below that, in small type is the line Dressing & Sandwich Spread. Is it mayonnaise or is it intended to compete against Miracle Whip? And what specifically does Carefully Crafted imply especially when Hellmann’s already offers the brand promise of “bringing out the best” in your foods? The label emphasizes a “free from” list including non-GMO sourced ingredients that from a clean standpoint should have appeared on the organic label yet was notably absent. Hellmann’s has become an iconic brand – to the point where Hellmann’s and mayonnaise are synonymous. I understand the marketing benefit of adding style and flavor variations to an established brand but I do not understand why the branding on this packaging has been diluted as a way to distinguish a product or brand alternative. The format of Hellmann’s packaging has limited space for branding yet over time they have established a brand image with incredible visual impact and recall. I would argue it would make more sense to capitalize on that strength to draw organic customers to their new products.